Our mission is to equip churches to create a spiritual home that ministers to the practical, emotional and spiritual needs of caregivers, giving them the tools and resources to help caregivers connect with their faith and encounter Christ, so that they can see the grace and blessings in their caregiver journey. Nourish was launched Fall of 2015, in Downers Grove, IL at St. Mary of Gostyn Parish by Deb Kelsey-Davis and Kelly Johnson. 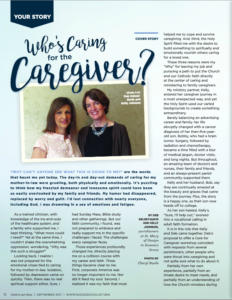 Fueled by their personal crises and caregiving experiences, Deb and Kelly shared a strong passion to place the church and faith directly at the center of caring for caregivers. And as God would have it, Nourish was born and quickly grew. We’ve proven the impact of the program and viability of the ministry, and are abundantly blessed to see how Nourish has touched and supported the lives of so many family caregivers. Read more of our story in the Catholic Diocese of Joliet's September 2017 Christ is Our Hope magazine. Deb Kelsey-Davis, RN, MHSA, is a caregiver to her aging parents, one of the most important and challenging roles of her lifetime. She is a life-long clinician and respected healthcare leader. Deb is also a member of the National Association of Catholic Nurses (NACN-USA) and holds a Lay Ministry Certification from the Archdiocese of Chicago’s Called and Gifted Program, bringing with her 20+ years ministry experience. In 2014, she found herself on a collision course with her career and her faith, causing her to leave the corporate world. The events that led up to this life-altering moment came from her experiences while caring for her mother-in-law, Eva. Deb was not prepared for the emotional crises and spiritual isolation that came with caregiving. Realizing many others felt this way, in 2015 Deb founded Soul2Soul Solutions, Ltd., to focus on feeding caregivers' souls. Shortly thereafter, she approached Kelly Johnson, Director of Adult Faith Formation at her local parish, with the idea of starting a faith-based program to support family caregivers. Without hesitation, and with the same-shared passion, Kelly and Deb partnered to build Nourish. 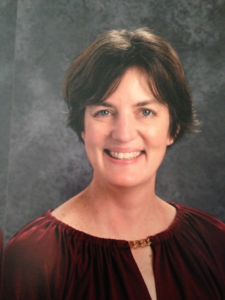 Deb holds a Masters degree in Health Services Administration from the University of St. Francis. She holds a certificate from USC Davis School of Gerontology in the Fundamentals of Gerontology. 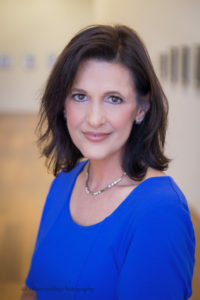 She is a Registered Nurse (RN) and is a charter member of the National Healthcare Cost & Quality Association, as well as an active member of the NACN-USA, American Society on Aging, Society for Participatory Medicine, National Association of Professional Women and ARA Mentors. Kelly Johnson entered her caregiver journey in a most unexpected way. Life abruptly changed with a cancer diagnosis… her then-five-year-old son, Bobby, had a brain tumor. Surgery, chemotherapy, and radiation made for years of long nights. Kelly and her husband, Bob, are continually amazed at the beauty and graces coming from the journey. Plus, the story is a happy one, as their son heads off to college. Along the way, Kelly tumbled into a vocational calling in Adult Faith Formation. It is in this role that Kelly and Deb came together. Partially from her own experience, partially from an innate desire to meet needs, and partially from an understanding of how the Church ministers during times of transition and change, Kelly, with Deb, created Nourish. From her career in Advertising, Kelly brings managerial leadership skills required to balance the demands of client needs with the agency’s ability to deliver. She became a Vice President, Client Services, before the age of thirty. Her client list included Kellogg’s and Lea & Perrins, as well as Inland Steel, Sprint Cellular and Kroger Foods. 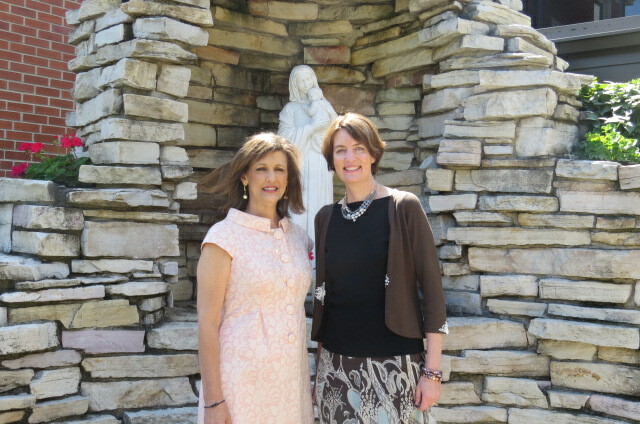 Kelly is a member of the National Association of Catholic Family Ministry and the National Conference of Catechetical Leadership, both tied to her role at St. Mary of Gostyn Parish in Downers Grove, IL. Through the Archdiocese of Chicago and Diocese of Joliet’s Lay Leadership Institute, Kelly completed her Lay Leadership certification and is pursuing a Catechetical Coordinator Program at the University of St. Mary of the Lake Seminary in Mundelein, IL. Kelly has come to realize that she may have plans, lists, schedules and agendas, but God wants growth, a real substantive increase in our faith and trust in Him. She is continually awed at the way in the God stretches and blesses her. We thank Father James Schwab and Father Shaun Cieslik of St. Mary of Gostyn Parish, for their support and belief in our vision to bring Christ and caring to family caregivers. Do You See a Need? Would You Like to See Your Church Help Families Caring for a Loved One? We can help you make that happen! Click Here for Our Help!